Regulations designed to make diesel engines safer are increasing the risk of harvester fires in Australian conditions because they require engines to run at hotter temperatures to burn particulate matter. The same risk-averse approach to policy-making is also costing Australian farmers valuable access to efficiency-creating technologies being enjoyed by their global competitors. This is according to Mark Swift, a NSW farmer and Nuffield Scholar, who has been investigating the impact of the increasing burden of risk-management-based regulation on Australian agriculture in recent years. At last week’s biennial Australian feedlot industry conference BeefEx, he explained how these seemingly well-intended policies are having unintended and detrimental consequences for farmers on the ground. Mr Swift’s studies have focused specifically on how policy-makers use the “precautionary principle” as a risk management tool. The precautionary principle states that when a person or business is taking a particular action, and there is no scientific proof to the contrary, it is up to the person or business taking the action to prove it is not harmful. 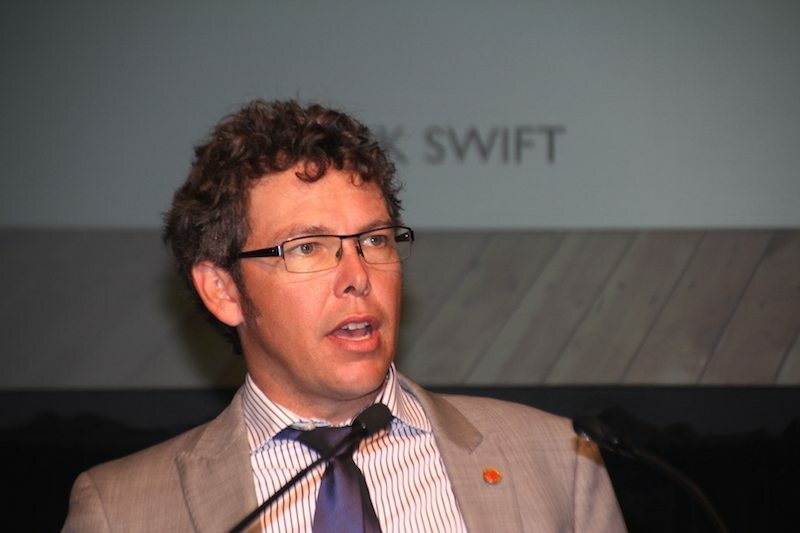 Mr Swift said Australian policy makers use the principle to treat every new development ‘as if it has catastrophic consequences for human health and safety or the environment’, which is effectively preventing Australian agriculture from enjoying the same access to technological advancements as their competitors. He was motived to act by what he saw as a frustrating example of Government hypocrisy. On one hand the Federal Government had initiated a program looking at why productivity was flat lining in Australian grain sector, while at the same time it was restricting tools that would allow the grain industry to improve its productivity. Example? Consider the difference between the Australian and Canadian approaches to handling the introduction of GM canola. GM canola offers increased herbicide tolerance, a trait that can reduce costs, improve efficiencies and give canola growers a competitiveness advantage in export markets. In Canada few restrictions were placed on its use. Farmers there adopted it very quickly, and GM canola grew rapidly, soon accounting for 90pc of canola seed sales. The area grown to canola in Canada and tonnages produced also increased significantly, strengthening the country’s position as the dominant provider of canola into the export market. In Australia, the approach could not have been further apart, Mr Swift noted. Here, the Office of the Gene Technology Regulator first required six years of field trials. Biotech in Canola was then approved, but that was followed by another six years of State-based moratoriums preventing its use. GM canola also had to be segregated and handled through separate supply chains. This meant that in towns like Parkes, where Mr Swift farms, an archaic grain receival site had to be re-commissioned to handle GM canola, adding further distance, costs and inefficiency for farmers growing the crop. Mr Swift estimates the additional costs amount around $100 a tonne, a big hit on a crop that may return around $500 a tonne. As a result, he said the technology is still only being used in about 23 percent of Australian canola production, and is mainly being used only as a last resort to solve agronomic issues. “Ultimately this scenario has reduced Australia’s competitiveness as a low cost canola producer,” Mr Swift said. Further implications for Australia had included the withdrawal of companies from the Australian market, no new products in the pipeline in terms of GM, a 12-year hiatus when breeding programs were effective shut down. Regulations designed to make diesel engines safer are also increasing the risk of harvester fires in Australia’s unique conditions, Mr Swift explained. In the past 20 years new tiers of standards have been placed on the manufacture of diesel engines to reduce polluting emissions. Mr Swift said the issues associated with the increasingly onerous standards became most apparent to Australian machinery customers with the introduction of Tier 4 standards in 2014. The sparse nature of Australia’s cropping environment and limited access to specialised parts and techicians meant growers now faced increasingly serious impacts when these highly sophisticated machines broke down. Engines now had to operate at temperatures as high as 600 degrees Celsius in order to burn particulate matter or soot, which created a new set of hazards in Australian conditions. “This is an issue not just for Australia, but our risks are far greater due to our operating environment with high temperatures and low humidities,” Mr Swift explained. Mr Swift said seemingly prudent policy goals of minimising harm and risk were having unintended consequences, which was slowing productivity growth and impacting most heavily on the people with the least capacity to afford it. “The critical point here is when is enough enough? “Are the losses from productivity due to timeliness ever factored into the business case or the cost benefit analysis of when these regulations are introduced? Mr Swift said encouraged farmers to take proactive action such as getting involved in representative organisations or politics to try to bring awareness of the consequences of overzealous risk aversion in policy making. “Alternatively you can stay at home and adapt to the system, realise that these changes are coming and are going to more stringent. These regulations may or not be actually providing any benefit to society, but they would certainly have a very real impact on farm businesses and productivity in Australia, he said.